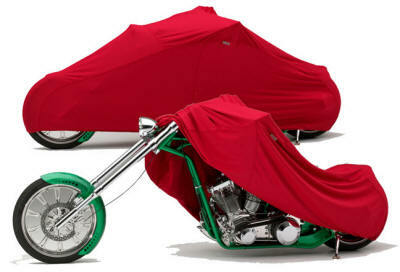 Covercraft Industries line of Form Fit motorcycle covers are designed to fit the shape of your factory bike, regardless of what make or model you own. Sharing the same features as the Form Fit Car Covers, these lightweight bike covers are great for covered storage on road trips or indoor storage at home. FormFit covers are available in red, hunter green, charcoal gray, dark blue, silver gray and black. Body-hugging polyester knit outer shell is made with spandex (to provide stretch and recovery). 100% cotton terry loop is added to the underside of the shell during the knot process and then sheared to a luxurious fleece finish. Fleece provides a super soft touch against fine paint finishes, wind screens, chrome, etc. Form-Fit covers follow every curve of the bike for a truly custom fit. Available for choppers to 10 feet overall length, full dress touring bikes, cruisers and sport bikes. Easy to clean - just throw it in the washer & dryer at home! Cover fabric performance can be severely affected by dirt that builds up on and within the material creating a 'wicking' effect that actually helps pull water through the fabric, nullifying any water resistant properties the fabric may have had. Cleaning your cover will help to keep your motorcycle, scooter or ATV clean and also increase the service life of the cover. Using a large commercial washer without agitator, wash the cover using 1/4 cup of Simple Green All-Purpose Cleaner. Put the cover in the washer and pour the cleaner in the tub after it's filled with warm water or pour it directly in the machine (some wall mounted commercial units), then put in the cover and start the machine.